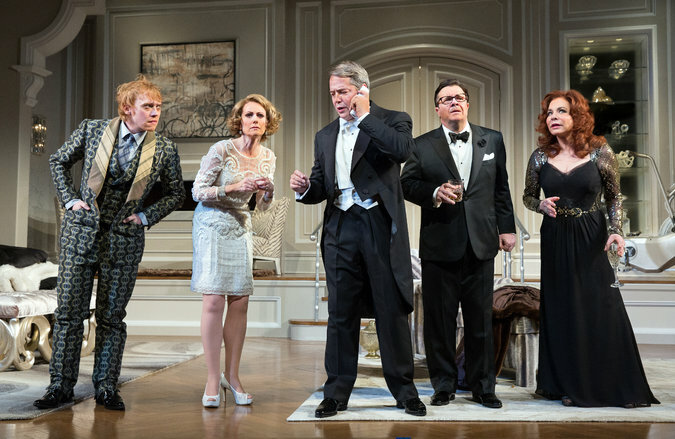 This Terrence McNally revival packs a lot of star power but no punch. Listen folks, I’m sorry to report that I was disappointed by It’s Only a Play. Matt and I were very much looking forward to it, and being that it’s one of the hottest tickets, this was one of our splurges money-wise this season. With its starry cast, stellar creative team, and modernized script, we figured we couldn’t go wrong. The loose plot centers around a group of theatre people at an opening night party awaiting the reviews, primarily the Times. You’ve got the producer (Megan Mullally), the playwright (Matthew Broderick), the director (Rupert Grint), the star (Stockard Channing), a critic (F. Murray Abraham), the playwright’s friend who passed on the project (Nathan Lane), and the coat check boy (“introducing Micah Stock”). All in one room told in real time (click here for highlights). Things start out amusingly enough. I mean, I’ll watch Nathan Lane live anytime with a perfectly content smile on my face. There’s a section early on with just him on stage, and I would have been happy if the whole play had been that. Maybe I’ll go watch The Nance on PBS instead and revisit that production. It’s Only a Play is overflowing with inside jokes about the theatre world, many of which would completely go over the average theatre-goer’s head. McNally has updated all of the now-dated references to today’s celebrities and to more recent theatre tiffs (e.g. Shia LaBeouf, Alec Baldwin). Practically every show currently running on Broadway is thrown into the mix, and it gets old fast. There is more name-dropping in this show than…um…just trust me. Hilary Clinton, Denzel Washington, Frank Langella, Lady Gaga, a whole lotta names – most of which are mentioned alongside jokes at their expense. There are so many punchlines that are equivalent to a celebrity shout-out that it started to get on my nerves. Those are cheap shots in my book (although the malicious jokes didn’t seem as malicious coming out of Lane’s mouth). Matthew Broderick’s stiff performance falls flat with his consistently understated and monotone delivery. Any energy that is built up by the other characters collapses around them when he arrives onstage. He has a huge speech in the first act (which ends with the line: “Speech done”) when he gets up on a soap box and talks about the theatre today and how its integrity is basically falling apart at the seams. What have we done to it? Remember the good old days? And so on and so forth. People applauded like crazy afterward, yet I sat there feeling insulted. I understand the self-awareness aspect of referencing the trend of movie stars taking over Broadway and names above the title, and that’s what this play is doing too (get it?? ), but it didn’t come across as witty to me. [title of show] did the self-aware comedy much more effectively and humorously. Nathan Lane’s character referring to the actor Nathan Lane for an easy laugh? Come on. There was so much applause after lines, big speeches, entrances, and exits, I couldn’t wrap my head around it. Were the people around us clapping for the play? The production? Or just the stars they love? Does Stockard Channing leaving the stage after saying something triumphantly warrant exit applause? If it had been any other actor, would the audience have cared? Wow, I’m starting to sound bitter. Let me dial it back, and get back on topic. Take a breath, Becca. Perhaps I’m not the target audience. I know that the most of the reviews tell me I’m in the minority, but neither Matt nor I laughed much. Grint was a caricature, as was Mullally. This approach could maybe work if everyone was giving the same stylized performance, but with Broderick, for example, playing everything down, you’re left with a bunch of people in different plays. One of the things that makes You Can’t Take It With You such a hit in my book is that it has a cast of fully-realized individual characters who all could be the star of the show with their crazy antics, but simultaneously, they’re in sync with one another. That family is under the same roof and in the same play, whereas It’s Only a Play’s characters all seem to be attending different opening night parties.